Last week saw the S&P begin its final rally for the current T coming off the 55 day MA support level. See the updated chart at the link below. The peak for this phase is likely to be in the early November period after which a correction should occur as we move further into November. Next week I will begin the theory of the new T which should provide a good rally to finish 2007. Last week saw the S&P drop to 1500 near the 55 day MA support level 1510 which should provide its normal support for a brief ( like 5-7 days or so) rally. See the updated chart at the link below. 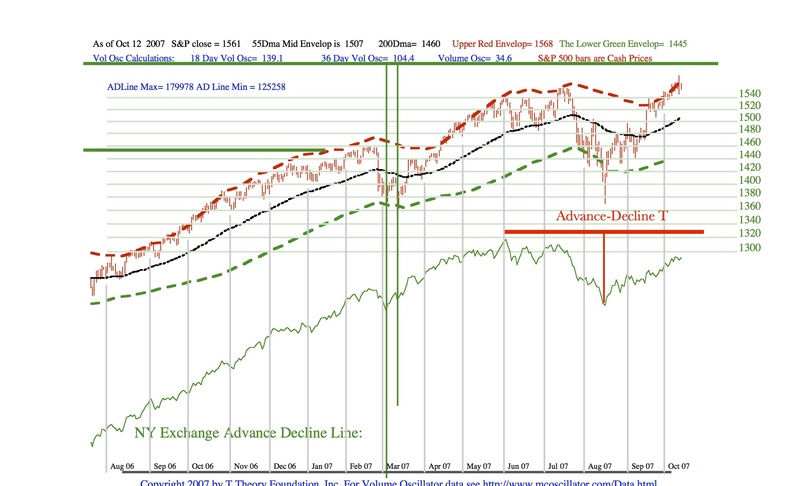 Two weeks ago I wrote that the recent history for this bull market has been to see the up-trend signal its topping by first falling to the black 55 day MA line at the mid channel of the envelopes, then rally back up to the old highs near the upper red envelope and finally fall more seriously to the lower green dashed line marking the lower envelope. This sequence can be seen during the earlier June/July period in this chart. 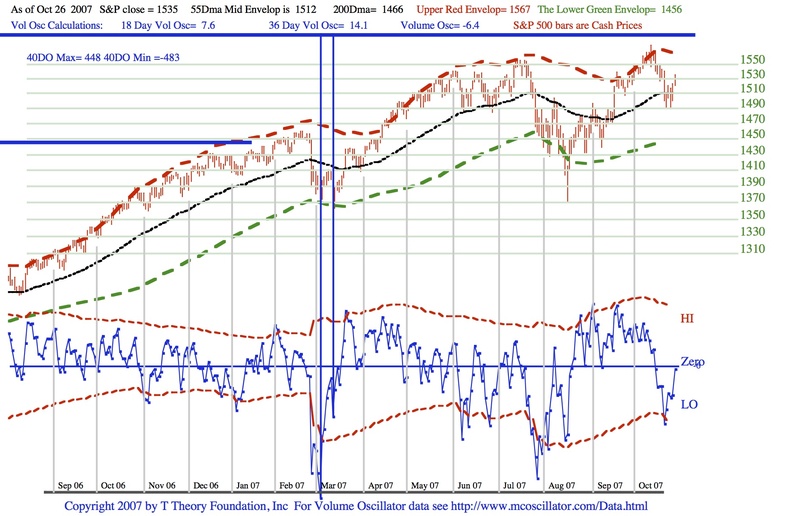 The new piece of information from last week came on Friday when the Arms Ratio (also known as TRIN) rose to the extreme high of 3.5, in line with its extreme oversold reading that occurred at the mid August Low. 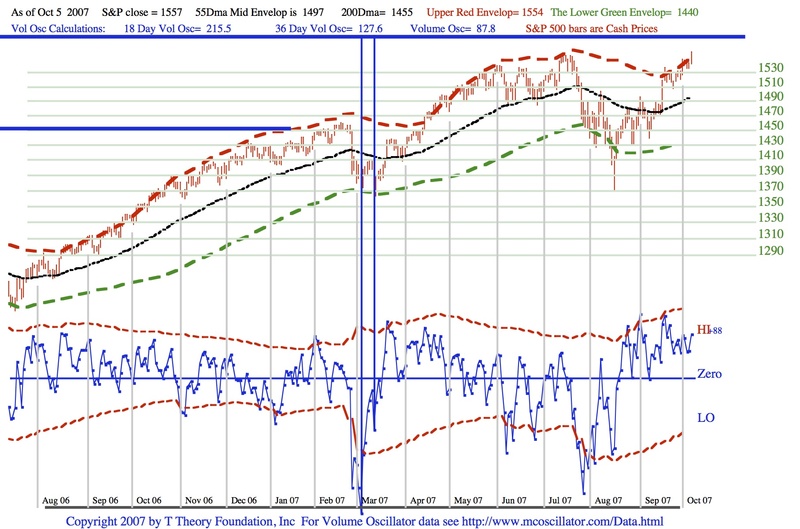 This technical overbought/oversold indicator was developed by Richard Arms and can be searched on the web for a more complete description if you are interested. I have produced many long term studies of this indicator in the past and finally concluded that its usefulness was largely confined to the very rare cases when its value deviated very far from its neutral reading of 1.00. This occurred in mid August and again last Friday so some sort of rally is likely if the S&P can gain footing not too far below the 55 Day MA. So for this week I will be looking for evidence the S&P can stabilize at the 55 DAy MA then mount a sharp rally into the old highs for a brief period, typically a week or so. Next Monday I will repost and we will see if this indicator is worth adding to the bottom of the current chart for those rare times when it has something important to say. The general status of the indicators in the updated chart below continues to be an overbought market but one with sufficient upside momentum to reach the current T’s projected early November peak. Note the S&P 500 is steadily riding against the upper envelope limit. 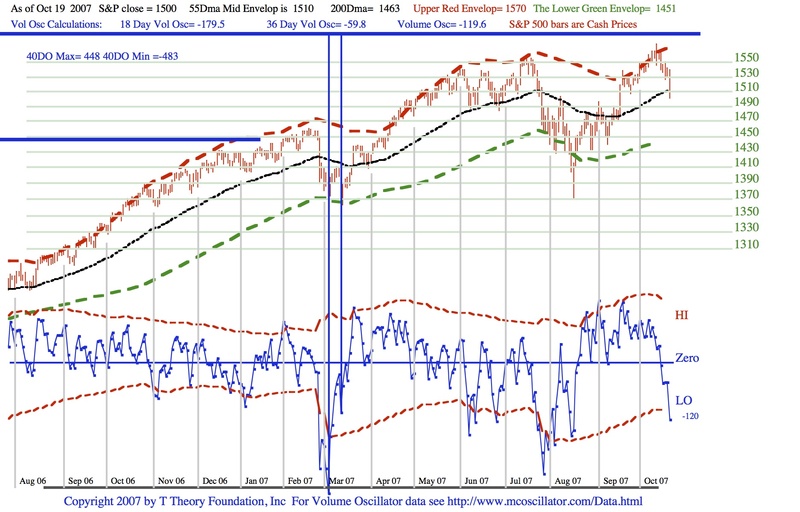 Also note in this update I have replaced the lower volume oscillator plot with a simple green Advance-Decline Line plot for the NY Exchange and added a simple time symmetrical Advance-Decline T in red. 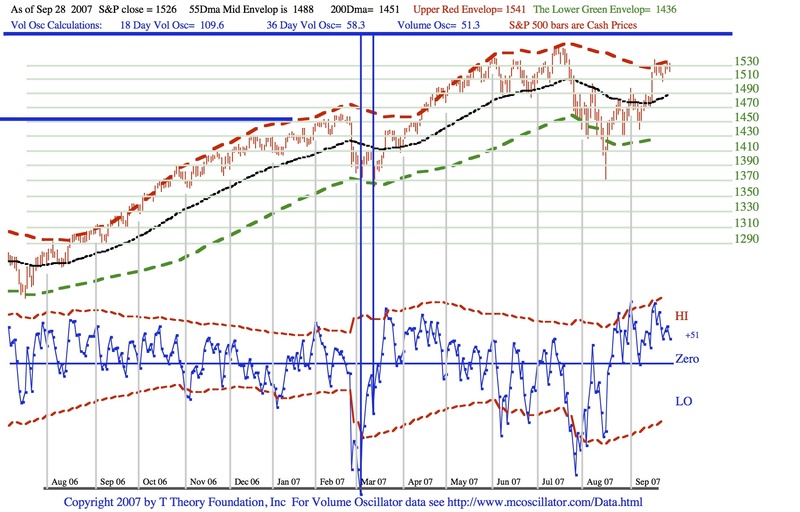 Both the regular Volume Oscillator T and this simple T project a late October or early November peak. The general status of the indicators in the updated chart below continues to be an overbought market but one with sufficient upside momentum to reach the current T’s projected early November peak. As long as any significant corrections hold the 55 day moving average at the black line in the chart, currently 1497 and rising, the projected up trend is OK from a historical perspective. In the recent past the pre-warning of a more important correction has come when the up-trend weakened to the point that a correction down to this key support level was necessary, after which, a bounce up to a retest of the old highs followed with greatly diminished enthusiasm. If no such weakness sets in during October, a better way to confirm this Volume Oscillator T’s projection, which you can see is derived from the distant March 07 low, is to switch over to a shorter term Advance-Decline T with its center post in the mid August period. This very much to be preferred because the projection time is much shorter. You can do this on your own for now, but I will switch to a daily chart of the cumulative NY Exchange Advance-Decline Line in my next next Monday posting, and from then on, I will work out the more precise time symmetry in order to illustrate the basic T Theory time symmetry as a real time example. The S&P 500 plot relative to its Red and Green (Max and Min) envelopes and the Volume oscillator as noted in my updated chart at the PDF link below are both in typical market over-bought conditions, so minor corrections can be expected within an overall up-trend. T Theory sees the momentum lasting into early November via the current T’s peak, at the right end time period of the T.
During October this would be the basic forecast from the long spanning T that has seen a serious, but not fatal dip, within its right side. 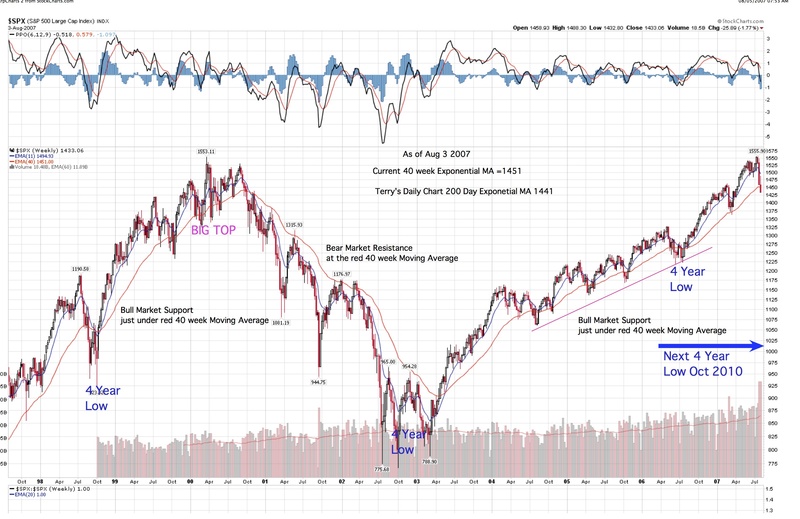 It is believed that the August dip and subsequent the recovery so far is part of the long range Advance-Decline Ts projection of a major peak for equities in late 2007, with a decline beginning into the next 4 year cycle low previously estimated in the general October 2010 period. We need to monitor this eventuality, but for now the daily swings within the envelopes are key. A successful early November peak could represent one major top for equities. Any correction back to the black 55 day Ma is not likely to be serious, but a rally from this key resistance level, if it occurs, should be sold. If the current rally hangs tough during October and does not see a correction back to the 55 day MA, then a correction thereafter, can still recover using the alternate T construction for a year end peak as per my last update. The issue here is that the long range T could produce a series of peaks into the Fall, any of which could represent the final topping phase of the A-D T. Most of my future analysis will concentrate on the possibility that a major peak is developing over this general time period. So in the end, the major work for October, November and December will be to confirm (or not) the long term Advance-Decline Ts major peak forecast for the late 2007 period has occurred and whether its forecast of long term decline into the next 4 year low (roughly Oct 2010) looks to be developing normally in technical trend terms. This entry was posted on April 17, 2013 at 12:18 PM and is filed under . . . T Theory®. You can subscribe via RSS 2.0 feed to this post's comments. You can comment below, or link to this permanent URL from your own site.